I’m not a flower child of the 1960s, but I’ve met enough aging free spirits to appreciate the tumultuous decade. I gaze with fondness at peace signs, despite not being old enough to wear a bra in that decade, let alone burn it. My husband Paul equally likes all-things 1960s. When younger, he was a wild child, speeding across the country on his motorcycle, letting it all hang out while the wind tousled his mane of hair (no helmet laws yet). Today, his wheels stay a lot closer to home. Speaking of home, where “flower power” was once a symbol of non-violence, now my sweetheart refers to “flour power” when choosing our kitchen appliances. “Yeah, groovy, man,” I muttered under my breath. “How much is this thing going to cost just to make some pizza dough?” I no longer muttered; I yelled. “Greeeeaaat.” I’ve managed to make meals with a wooden spoon that wields enough power to whip everything into submission. I simply raise it at my bowls of wet and dry ingredients and they snap to attention. No flower/flour power ideology need enter my kitchen. And there’s the hand-held mixer with three identical speeds that I was given when we married. Still beating. Paul wants to take us from a yellowing $15 mixer to a $730 pearl metallic powerhouse. Bummer. And here I’m trying to lessen my carbs! We enjoy celebrating special meals with a glass of wine or two. But you can’t drink and drive so that means taking a cab or Uber from the restaurant. That also means going into the cold dark night after your cozy meal. Sometimes cabs and Ubers aren’t quickly available. Waiting 20 minutes in a restaurant doorway is a definite buzz kill . . . behold, the pleasures of home cooking. Yet the motive for home cooking hasn’t been to save money. If anything, our grocery bills have grown savage. For instance, I ate a couple of fresh-baked cookies and discovered they called for a $5 bag of ground pecans. Didn’t taste a single nut. The recipe also included several dollars of chocolate chips and toffee. The only way I’ll reduce our grocery bills (and waistline) is to wire my mouth shut. How the times have changed from the 60s to today. Now when I ask, “What’s your bag?” Paul answers, “Flour, baby. Best for bread, rye and multi-grain.” His “secret stash” of baggies are filled with fennel and rosemary. Power to the people. Make that power to my tie-dyed chef. Canadians must be a sorry lot because they’re always saying they’re sorry. When I bumped into a woman at the grocery store, she was the first to apologize even though it was my fault. No contest, we’re all sorry. I’ve said “sorry” after someone walks in front and cuts me off, and after banging my knapsack against a street sign or hitting my knee on the coffee table. 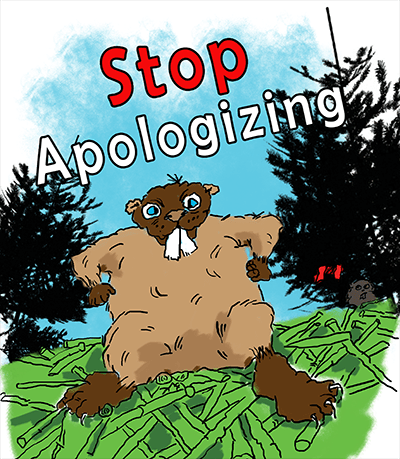 I’ve heard myself apologize to a cashier after being overcharged, as if I did something wrong. I’ve gone beyond sorry; I’m flirting with pathetic. I want to act more like my hero, Judge Judy. I watched back-to-back episodes of her courtroom TV for the first time. This woman is amazing. And lucky. Not only does she get paid Hollywood big bucks to wave her legal wand over a teenager suing an ex-boyfriend for throwing a bagel, but Judge Judy gets far greater license — she’s allowed to yell at people. Judy doesn’t need to burn off frustration through Tai Bo classes or therapy sessions. All she has to do is go to work. If I could yell at people in my courtroom, I’d be pinching myself to make sure I wasn’t dreaming. And I’d almost feel guilty about cashing those hefty pay checks. I said almost. “Want justice? Call Judge Judy.” Are you kidding? What sane plaintiff and defendant would voluntarily go before this Queen of Scream when there’s a 99% chance of public humiliation, broadcast to millions of viewers. Not only is the guilty party raked over Judy’s fiery coals, but the innocent person can be thrashed as well. Apparently no one should waste Judy’s time with ridiculous law suits. You have a good excuse for throwing your son’s computer through the window? Don’t bother explaining as Judy doesn’t care. No witnesses, pictures and receipts to support your claim or defense? Go tell it to the mountain – Judy refuses hearsay. “Real cases, real people, real justice” is announced for the show’s introduction. The producers should include a medley of her famous lines: “Do you think I’m stupid! Grow up! Pay attention! I’m not talking to you! Put your hand down! You live like a pig!” Ths woman knows how to wield an exclamation point. Judge Judy is anything but gender-biased. She’s cranky clear across the board, whether you’re a deadbeat dad or a bar-hopping mom. Young and old alike are (mis)treated equally. I have to respect a woman who writes a book entitled, Don’t Pee On My Leg and Tell Me It’s Raining. Judge Judy, you rock. Obviously I can’t turn into Judge Judy overnight. Maybe I’ll start the process by replacing “sorry” with “excuse me.” Except when I walk into a street sign. For that I’ll always say “sorry” because those “No Stopping” signs can have attitude. In 1978 President Jimmy Carter proclaimed the first Sunday in September after Labor Day as National Grandparents’ Day. The idea originated from a woman in West Virginia whose motivation was to persuade grandchildren to listen and learn from the wisdom of their grandparents. This special day reminds me to appreciate my own family tree. Take my grandfather, a hard-working and good-natured farmer. He had a wooden leg, the result of a war injury. As a farmer, dealing with a missing limb must have been a daily challenge although my mother says she never heard him complain. Today, prosthetics are made of lightweight polymer and flexible titanium capable of increasing agility and mobility. None of that innovation was available for my grandfather’s leg: his was a heavy and unwieldy contraption held in place by a bulky harness and shoulder strap. Although it had a knee hinge, the mechanism didn’t always work unless my grandpa gave it a couple of hard thumps. He told my mom that the knocks were to show it who was boss. Grandpa also swore this leg had a mind of its own. Correction: Mom said he did complain one day when he started to limp and couldn’t put any weight on the prosthetic. Climbing in and out of his tractor produced a stabbing pain at the place his thigh joined with the artificial leg. Sitting on the side of his bed at night, he told my grandma that he was glad the day was over, that he’d have to see a doctor about his sore leg . . . until he unstrapped the harness. Lodged in the leg’s socket was a ring of keys. “Hey, I’ve been looking for these all day!” and he started to laugh. His pain was from several jabbing keys! It never occurred to him to take off his prosthesis and check. “Too busy,” he told Grandma, caught up in his laughter. Even after Grandpa passed away, the artificial leg continued to cause trouble. My mom was enlisted to bring it home from the hospital. But what was she supposed to do with it? She decided to phone the Salvation Army and the charity agreed to pick it up. An entire week went by. While waiting, nobody wanted Troublemaker in their bedroom (I was scared of it!) so Mom propped it inside the front hall closet behind our coats. When Grandma phoned to say she was driving in from the country for a visit, Mom called the Salvation Army again and explained the situation. “Please,” I overheard her imploring conversation, “I don’t want my mother to see his leg, it’ll be too painful for her!” Still no truck. An hour before my grandma arrived, a driver picked up the leg and my mom could relax. Her relief was short-lived, however, when days later someone from The War Amps phoned to inquire about the prosthesis. He wasn’t happy to hear that she’d given it away and informed Mom that it had been “on loan” for all those years. “If it’s not returned by the end of the month,” he said, “you’ll be charged its full price.” That leg might have been low-tech and well-used, but it was still expensive. The same driver returned to our door and plopped the limb, now missing its sock and shoe, onto our WELCOME mat. “Hey lady,” he said. “Tell the owner to make up his mind about his body parts!” and he turned on his heel. I know why I’m not a Hollywood celebrity – I don’t have “star drive,” that necessary trait for a person to succeed on the stage or screen. I also lack another key factor: talent. Sure, I’ve made my lukewarm forays into the world of acting. Years ago, I took a few script reading and improv courses. And while living on the west coast, I did extra work in a dozen series and several movies. When I read about an audition for a local filmmaker, I blew the dust off my skimpy acting resume. Although no pay was involved, the challenge sounded like fun and I scheduled an appointment to read at a nearby hotel. After memorizing my lines, I skipped to that audition. But reading lines at your mirror doesn’t compare with doing the scene across from a stranger. When it was my turn to read, the script sounded completely foreign in my ears. I stammered and stumbled. “More quiet, okay, sure,” I said, wearing an idiot grin. What really went through my mind was, “What did I just do, flail my arms and shout?” At that surreal point, all I could focus on was remembering my lines and staring at the adorable scriptwriter, the one who read the other character’s lines. In the story, I was supposed to be his mother. “I WISH I had a son as cute as you,” I thought, and then realized I’d spoken aloud as the group started laughing. Laughing is too strong; make that awkward chuckling. Not only was I a bad actor, I felt like Mrs. Robinson, surrounded by a crew young enough to be my children. Surprise, surprise, I didn’t get the part. I couldn’t even give away my gratis acting services. While leaving the hotel, I had a flashback: I was doing extra work at a rundown movie set in Vancouver. After pulling off a shapeless dress three sizes too large from wardrobe, I sighed at the end of a long night. The actors and crew were cranky, the bag lunches were stale, and someone yelled at me during a take when my shoes made scrunching noises on the dirty floor. Plus, I wanted to tell the actor playing an FBI agent to stop mumbling and speak up! That two-bit series? The X-Files, listed as one of the longest-running science fiction series at 12 seasons. Turns out the mumbling agent Mulder was played by David Duchovny and I was in the pilot with him. The truth is out there: I’m a bad actor. Time to shelve my dreams of a Hollywood star and stick to writing, where I can invent my own characters and flail my arms until the cows come home. Or shout until I’m blue in the face. Pick a cliché and I’ll be there. With bells on. For appointments and meetings, that info goes straight to my phone calendar, which is the logical use of current technology. But if you open my purse, you’ll find three old-school lists on three scraps of paper held together with a paper clip. The first is titled TODAY, the second TOMORROW and the third MISC. for those tasks in need of future attention, somewhere between this week and the next century. If I have a dozen tasks on my current list, I take pleasure in crossing off each one as it’s completed. It doesn’t matter if I finish everything, as long as I know what I could be doing if I end up in a mall or various parts of the city. At the start of each day, I re-write a new TODAY list, bumping unfinished chores onto it and jotting down fresh tasks. Here’s one benefit to this routine: nothing is forgotten when we travel. “Wow, you remembered my lucky hat!” Paul will say. I’ll smile and shrug, knowing that I owe my organized life to a 99-cent pen and a few pieces of recycled paper. I’m also a list mentor. I convinced my husband’s friend that life becomes more productive and less stressful with a list. He followed my advice and awoke the next morning to a reminder on his cell’s calendar: PHONE BILL. Then he spent the next hour trying to recall which Bill he was supposed to phone – he works with three!) and why was he supposed to call this Bill? It wasn’t until late afternoon that he remembered: PAY THE PHONE BILL! At least he tried. Hey, good list making takes practice. Maybe some people should continue to limp along through their list-free worlds, accepting missed appointments and undelivered dry-cleaning. Apparently they’re happy, even if they forget to mail that Welcome New Baby card before the child begins college. I admire my current doctor and her no-nonsense approach to my body when I haul it into her clinic for my annual check. Her quiet inspection is appreciated because any gasps, giggles or “hmms” would make me nervous. Despite scheduling an appointment weeks in advance, I’m tolerant of the required wait time. As for the magazines, some are outdated and dog-eared. While taking furtive glances at other long faces who share my delay, I contemplate the person who assigned the phrase “waiting room.” He/she is a genius because never did two words better describe both process and surroundings. This same brain obviously invented the word “patient,” as in who you are and how you must behave while waiting. My only objection involves the patient gown. Did I say gown? Paper towel is more accurate. In the past, it was tough enough to sit shivering in a shapeless, backless cotton smock. At some point the shift was made to paper, which is not surprising in our budget-crunching society. “Take everything off and use that to cover up,” the doctor’s assistant said before she closed the door. “Cover up with what?” But she was gone and it was just me and my square of paper, neatly folded on the end of the examining table. This wasn’t a gown, this was a large serviette. I was to cover up and maintain a shred of naked dignity. When I tried to arrange myself underneath, I felt like a paper cut-out doll. And if I didn’t stay still, my serviette would slip to the floor. Although the instruction was to take everything off, I drew the line at socks and glasses. What if the fire alarm suddenly rings? I’ll need socks to keep my feet warm and glasses to see where I’m running. Anyone gripping a flammable paper towel should stay away from direct flames. And knock on wood that my doctor doesn’t find anything wrong with me. On second thought, don’t bother knocking on wood. During your next doctor’s visit, you’ll be wearing a tree in the form of a paper towel. Gently rub a corner of it for the same superstitious results. As for those vintage magazines in the waiting room, I have a suggestion: convert them into cover-ups. They’d be thicker than the cover-ups I’ve been given. More importantly, patients will have something to read while they endure that second near-naked wait for the doctor to arrive. Did you know that Trump won the US election? Good thing I went for a check-up!